It’s spring and that means the rhubarb is back!! Yay!! I love, love, love rhubarb desserts however one of my favorite rhubarb treats is strawberry rhubarb jam. But you know it is kind of spendy to buy in the store so this year I was bound and determined to try and make it myself. 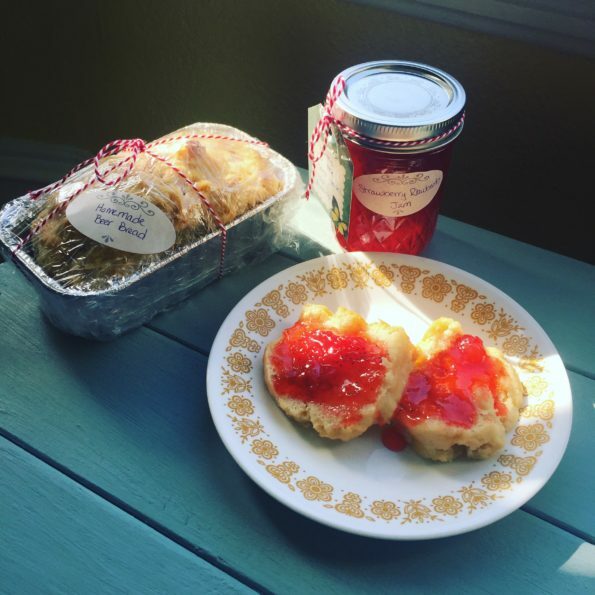 I’ve never made jam before and I would consider myself somewhat of a novice in the canning field but my go to canning guide book assured me canning jellies and jams is a great place to start – and they were right! I tried it and goodness gracious it actually worked!! Combine fruit, butter and pectin in sauce pan and bring to a rolling boil (meaning it will be boiling even while you are stirring it). Add sugar and bring back to a rolling boil for 1 minute. This will fill 6 (8 0z.) jelly jars. At this point you can either can it or freeze it. Preheat oven to 350 degrees Fahrenheit. Grease or spray a large loaf pan or 3 mini loaf pans. In a bowl, wisk together all dry ingredients. Add beer and stir with a wooden spoon until combined. Pour half the melted butter in the bottom of your loaf pan. Place your dough in the pan. Pour the remaining melted butter on top. Place loaf pan(s) on a baking sheet and bake for 50-60 minutes ( For the mini loaves I believe I baked for about 35-40 minutes). Top will be golden brown and toothpick should come out clean if inserted. These yummy treats won’t last long in your house and like I mentioned earlier, are perfect for gifting. In fact my kids helped me make a few batches of the beer bread and not only did they give some to their amazing teachers for an end of the school year treat, we decided to use them in our family project this month. We brought some yummy loaves and jam to our local hospital and clinic as a thank you for all the hard work they do. We are more than blessed to receive such quality healthcare in our own small town. The long hours, comfort, compassion and care these workers (our friends and neighbors) provide does not go unnoticed. They are always there when we need them – like when someone’s child gets a pinto bean stuck in their ear at 9:00 at night and they have to go to the ER to get it removed. Not saying that has happened to us but – it has happened to us. 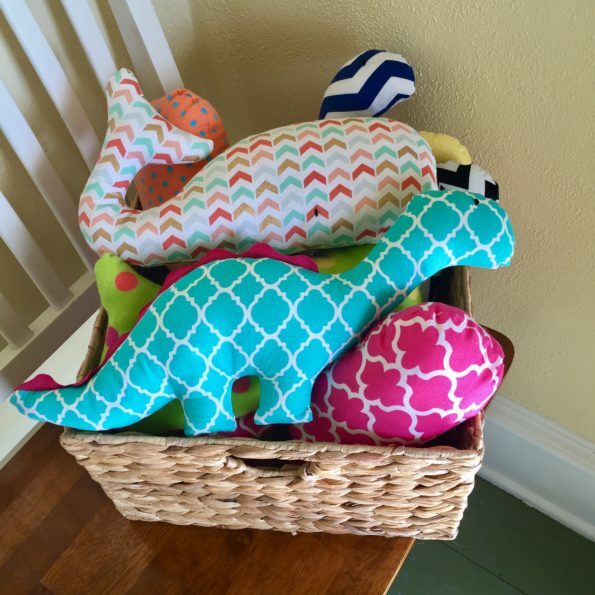 I also decided to give a few of my homemade stuffed animals for them to have on hand for any kids that come into the ER who might need a little extra comforting. I remember when I was 5 years old, before the days of car seats and seat belt laws, I was practicing ballerina spins in the back of our van while we drove my oldest sister and handful of her friends to Pizza Hut in the neighboring town for her birthday. You know those old rectangle vans that had a big open back with a bench seat along the side that could open up and store things. Well I was never meant to be a ballerina and go figure I fell and caught my eyebrow right on the corner of that multi functional, space saving, oddly placed bench seat. I started gushing blood but tried to hide it because it was the 80’s and as a child your fear of getting in trouble for acting a fool was bigger than your fear of losing your eye. Once we got to the restaurant I really had no choice but to fess up. So needless to say the pizza was picked up to go and we headed back to our town to the ER. Probably not the birthday party my big sister was hoping for – ahh, little sisters, such cute little rascals, huh big sis? Anyways once we got to the ER and I found out I was going to need stitches my adrenaline kicked into overtime and I’m thinking there was a good three nurses plus my mom trying to hold down my 45 pound screaming and kicking body so the doctor could do his job. Why am I telling you all this? I guess my thought process was, maybe if I had been gifted a special stuffed animal it would only have take two nurses and my mom to hold down my 45 pound screaming and kicking body. 🙂 Oh well, bald spots in the middle of your eyebrow are charming, right? You are amazing! I love reading your posts. You are so inspirational! Thank you for sharing!